This is a topic that you’ll read about on every “ex back” website and book: why you shouldn’t contact your ex girlfriend for a while after breaking up. The no contact period involves literally zero communication between you and your ex girlfriend… not even a one sentence text message. Why Can’t I Contact Her? There are a few reasons for the “no contact” phase. The first is that it will help you accept the reality of the breakup, and will force you to adjust to life without your ex girlfriend (for now). Secondly, it’s important to realize that your ex’s daily life and personal affairs are no longer your business. That’s not to say you can’t and shouldn’t be interested in her life, but you don’t have a right to ask about what she’s doing or where she’s going. She broke up with you, and she needs space away from you for now. Finally – and most importantly – the no contact period affects how she views you. The most important moments in your breakup occur in the hours and days after she tells you it’s over and you go your separate ways. 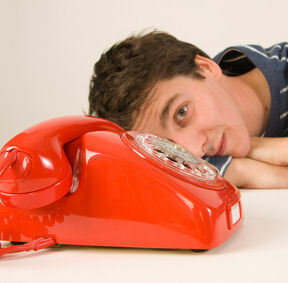 No matter how long you and your ex were together, she’s going to expect you to call or text. Ego is a big part of most people’s personalities – whether she tried to make the breakup as gentle as possible or whether hurtful words were slung back and forth, your ex is going to expect (and want) you to call her. She is going to assume that you’re still desperately wanting to get back together with her… and by not making contact, you’re showing her that she’s not in control of the situation. If you haven’t called or texted your ex yet, she’ll assume that you don’t want to get back together… and that puts you in a much better position. It removes her “safety net” – where she can fall back to your relationship should she decide the breakup was a mistake – and that will actually make her second-guess her decision to break up with you even more. No, sorry, there’s really no excuse. You don’t need to pick up that pair of running shoes from her house… it can wait for a few weeks. Aside from perhaps situations involving marriage, finances, or children… there’s simply no good reason for you to break the “no contact” rule in the first month or so after breaking up. “No contact” also applies to all lines of communication… including text messaging, Facebook messages, hand-written notes tucked under your ex’s car windshield wiper… these are all ‘forbidden’ during the no contact period. What If I Can’t Avoid It? Disappearing from your ex’s radar may be difficult at times. This is especially true if you travel in the same social circles, have mutual friends, or go to the same school / work in the same place. You may even just bump into one another at the local coffee shop, or find yourself out with friends only to discover that she was also invited to the event by inconsiderate mutual friends. In this type of situation, where contact is inevitable, try to limit that contact to one-word exchanges. Don’t be rude or overly cold, just say ‘hello, hope you’re doing well’ and try to cut down on any small talk she may try to initiate. In reality, this might sometimes be easier than you think, because if your girlfriend dumped you, she’s probably going to try to avoid you anyway (and if she does purposefully cross paths, that’s a good sign!). So, you’ve endured a month of complete radio silence between you and your ex… now what? 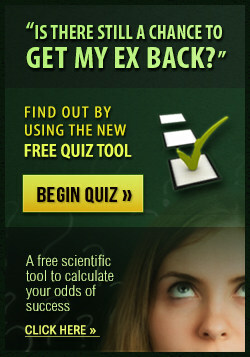 Well, this is where it gets really tricky… and where you can potentially win or lose your ex girlfriend forever. The first few times you contact her need to be very carefully crafted exchanges… you may be tempted to jump right back in to the serious conversation, but this is the time for a “slow and steady” approach. To avoid making some serious mistakes at this stage – mistakes that may end up permanently killing your chances of getting back together – you need to get a step-by-step guide that will walk you through this process. For the most comprehensive guide, I recommend The Ex Factor Guide, a highly affordable and extremely effective program from world renowned relationship counselor Brad Browning. He gives hundreds of real-world examples (exactly what to say, when to say it, what not to do, how to approach her, etc) that cover any potential scenarios you might face. After all, if this is the girl you want to grow old with, then you can’t afford to take any chances – click here to visit Brad’s website where you can get some additional sneaky little tricks that will help set the stage for your eventual reunification. Fore more on why the No Contact period works, check out the below video from Michael Griwsold, author of the excellent “M3 System” (which I reviewed here). Ok, so you know you shouldn’t be talking with her… but what do you do if your ex girlfriend contacts you? This can be an extremely stressful moment, but let me start off by saying that if your ex girlfriend contacts you, it is a good sign (even if she’s complaining about something). That means that she’s thinking about you. But how do you handle this situation? Well, what most guys do is that they start breaking down. They’ll start saying how much they miss hearing from them and how much they want to see them again. Don’t do this. In fact, if you ever want you attract your old girlfriend again, you got to do the opposite of what everyone else is doing! As counter intuitive as it sounds, if your ex girlfriend talks to you or even messages you, you have to pull back even further, but you have to do it in a polite and genuine way. Make sure you sound happy and that your life is on track. You don’t want to give her any hints that you’ve been moping around and depressed (if you were doing that). As difficult as it is, pushing her away when she wants to talk to her will set off a huge sexual trigger. When she realizes that you’ve moved on and that you aren’t needy anymore, she’ll begin to desire you again… and start to initiate even more contact with you. Remember, people (and women especially) want what they can’t have. But pushing her further back, you’ll begin to make her want you again. never initiate contact with the ex gf or bf if they are the ones who broke up with you if you did not do something major like cheat . Go no contact to heal . If they do not contact you , you move on . If they do contact you , then you take it one step as a time.